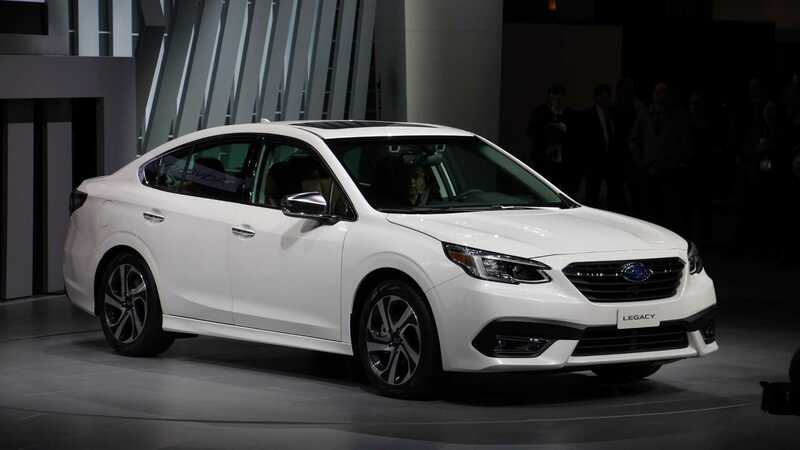 Japanese car manufacturer Subaru has come to the 2019 Chicago Auto Show with the next generation of its Legacy sedan. The company claims the updated car is “the most advanced and the most fuel-efficient Legacy in the entire history of the marque”. The vehicle shares its chassis and engine (2.4 turbo flat-four rated at 260 hp / 194 kW) with the Subaru Accent CUV. It comes equipped with an IVT box and has AWD in base. A cheaper alternative is available with a 2.5-liter naturally aspirated engine rated at 182 hp / 136 kW. Fuel consumption amounts to 9.8 liters per 100 km in urban environment, or 7.3 liters on highway. For our British readers, this roughly corresponds to 29 and 38.7 miles per gallon, respectively. If you live in the USA, read these as 24 and 32.2 MPG, respectively. Compared to its predecessor, the new Legacy is said to offer better noise insulation, improved steering and better overall comfort. The interior now offers much more space for the driver and passengers, and the trunk is now larger at 427 liters (15 cubic feet). Standard and available equipment includes an infotainment system with an 11.6” display in portrait orientation, several USB ports, an audio system consisting of 12 speakers, a Wi-Fi hotspot, and more. The base trim ships with lane control, parking assistance and blind spot monitoring. Higher trims also get a video camera-based drowsiness alert system. Sales in the USA begin this fall.